Rick Porcello or Steven Wright. Take your pick. 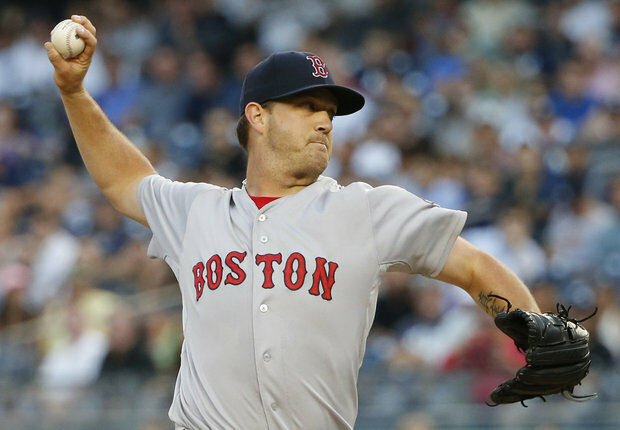 They have been the two aces of the Red Sox starting rotation thus far. And in a time when their $217 million “stud” David Price hasn’t had the best first month of the season, they’ve been extremely valuable. Porcello has the better record of the two at 5-1, but Wright boasts a team-best 1.52 ERA. On Sunday night the knuckleballer had his best outing yet, pitching a complete game and allowing just one run to improve to 3-3. He had a chance for the shutout before giving up a solo shot Brett Gardner in the bottom of the ninth. Luckily the Sox had a 5-0 cushion before the homer, courtesy of four dingers of their own. Dustin Pedroia started things off with a two-run blast in the first inning, his fifth of the year. Then it was time for the David Ortiz show. We mentioned a couple days ago how Papi is on his way to the greatest last season of all-time in terms of home runs and RBI’s. He added to that Sunday night with a solo homer in the fourth and another one in the seventh as he continues to be the best 40 year-old hitter you’ve ever seen. Xander Bogaerts added some insurance in the eighth with another solo shot, extending the lead to 5-0. The Sox are now 18-13, a half game behind the Orioles for first place in the AL East. Previous Is David Ortiz On His Way To The Greatest Final Season In MLB History?